Many companies launch into their Digital Marketing Strategy process somewhat blind. Often they have little understanding of their competitive online landscape. They may not even have formulated online objectives or goals. Should they engage with social media and if so how? It’s important to invest the time and effort upfront in conducting proper research and planning. The digital marketing strategy and roll out plan will then be based on a sound footing. We often find that digital marketing strategy sessions bleed into tactical discussions but let’s not get hung up on what’s a strategy and what’s a tactical plan – time’s short; you need to know where you are going online (strategy) and how you are going to get there (tactics). So in this section we’ll cover a practical overview of both aspects. This guide is focused on helping Irish Exporting SME’s to effectively utilise Digital Marketing Channels to reach their domestic and international customers. However the majority of the practical advice can equally be applied by domestically focussed businesses. Research and analyse your target market for your digital plan. Review your internal capabilities and outline your digital marketing goals. Research all aspects of your current eBusiness performance. Look at what your competitors are doing online. Lay out the key components of your digital marketing strategy. Document a roll out implementation plan. The approach outlined here is based on Inspiration’s fifteen years’ experience of providing services such as web development, search engine optimisation, online marketing support, email marketing and content marketing. Our strategic approach has delivered many successful outcomes for our clients. We hope our expertise and insights will help you develop an effective Digital Marketing Strategy based on our already proven process. A good digital marketing strategy is there to support a business plan – if the company doesn’t have a documented plan for the business, then how will you measure the success of the digital marketing strategy? Where your target audience is physically located? What industry sectors are you targeting? Who makes purchasing decisions within your target companies? Where are your target market likely to be found browsing online e.g. forums, industry sites, blogs? Who is your ideal ‘Buyer Persona’ or target customer? What websites have specific or indeed related trusted news about your industry? This is a useful quick ‘snap shot’ exercise to gauge your own level of internet marketing expertise. This process will assess the different key areas of your existing web presence to identify your strengths and weaknesses (similar to a SWOT analysis). Look at your website’s current performance in terms of key traffic metrics (visits, bounce rates, enquiries, source of traffic, online sales etc.). Look at the extent to which your current website is optimised for search engines. Ask do you have a comprehensive content marketing strategy driving quality content on your website, through your social media accounts and online generally. What social media accounts are you active on and what is your approach to each platform. Are you engaged in regular email marketing? These are the key pieces of background information to consider and document for your digital marketing strategy and plan. What are the companies Unique Selling Points? What messaging do we need to develop to communicate these USP’s clearly to our customers? What is your annual budget for digital marketing? 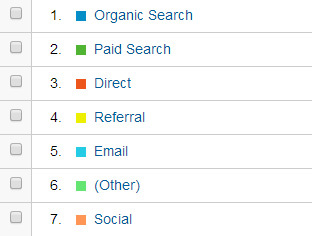 What keywords do I think my target audience might be using online to find our products / services? Your partner can verify these and make recommendations based on actual search activity. Who are my top 5 – 10 competitors in the target market? What offline marketing activity is planned within the next year? What conversion metrics do I need to implement and track online e.g. completed enquiry forms, inbound calls initiated from a web search, downloads , email enquiry direct from an advertised website email address. What internal resources do I have available to work alongside my digital marketing strategy partner in the development and roll out of the digital strategy and roll out plan. What content do I think might interest my target audience in both the short and long term? What concerns / issues do my target audience have which could be addressed through a longer term ‘evergreen’ content strategy? What content do I already have available in-house which might be useful for ongoing marketing purposes? How do we currently promote our content online – blog? Social media? By documenting your thoughts, insights and knowledge on the above 3 key areas upfront you will have identified a lot of the key data required for the Preliminary Research, Digital Marketing Strategy development and tactical planning phase. There are a number of preliminary research areas to look at in preparing your Digital Marketing Strategy. You may not need all of these nor have the resources to research each area in detail. However the more information you have upfront the better informed your strategy will be. There are also a variety of tools available to help you develop a more complete picture of your online landscape. We have linked to a few that may be useful in carrying out your research. This research will also help you better prepare for the potential website development stage of your digital marketing strategy, whether you are building a replacement site or starting from scratch. If you have an existing site with analytics implemented you can get an understanding of your existing target market, where they are located as well as their demographic profile. Google Trends can also give information about who is looking at particular search terms. Search Engines form a core aspect of any modern digital marketing strategy. Google accounts for 90% of the Search Engine market share in Europe. Luckily Google provide a range of tools for optimising and analysing your search engine marketing efforts. Understanding the search terms that your potential customers will use to find your products and services is vital for your digital marketing strategy campaign. Google Keyword Planner is very useful for determining keyword search volumes for geographical areas. For International digital marketing research we recommend using Global Market finder. This tool translates your keywords into languages used in the region that you selected and provides useful metrics to help you scope search volumes in international regional search markets. Ubersuggest is another effective tool for finding search term variations you may not even have considered. It is important to use these tools to find the keywords that your potential customers & prospects are actually looking for online. The industry terms you “feel appropriate” may not be the actual ones your customers are physically using to search for your products and services. At the same time a large search volume for certain terms or keywords does not necessarily indicate those key words are optimal for your business. They might not be the most relevant terms to drive the right or most relevant prospects to your site. Content refers to the words and images on your site as well as articles and information you might publish elsewhere on the internet. Use competitor analysis to see what strategies other businesses like yours have implemented in terms of content. Quality Content is the engine that drives your Digital Marketing Strategy and ultimately the success of your web presence. It is key to and at the heart of any Digital Marketing strategy. It is easy to overlook content but it is critical you don’t. The quality and number of links into your website are a significant factor in how search engines determine how to rank your website in their search results. Building high quality links from trusted, authoritative and relevant sites is an important aspect of your digital marketing strategy. You can use tools such as Moz’s Open Site Explorer to see what sites and pages are currently linking into your own website. You can also use it to identify the back links of your competitors’ sites. If your website has excessive poor quality backlinks or multiple backlinks using exact match anchor text your domain name may already have been penalised by Google. You may not have received an official warning from Google via webmaster tools but your website might have dropped in organic traffic over a certain time period. Use the PanguinTool from Baracuda Digital to see if your website has dropped in traffic in line with recent Google updates. You can also use Webmaster Tools or Moz’s Open Site Explorer to analyse the links and anchor text. Another paid tool that you can use is Link Detox. This tool analyses links and indicates whether or not they maybe harmful to your website. Top Tip – We recommend using a combination of all tools to get a clear picture of your back link profile. Social media can be a powerful channel in promoting your company, product and overall web presence. However choose the right platform(s). If your competition are not using a particular social media platform it maybe because their customers are not on it. Find out what social media platforms your customers are using. In fact Google now takes social media engagement into account in determining its search results. You can no longer say ‘It’s a waste of time or its not suitable for my business’. You have to engage with social media if you want to improve your rankings in search engine results – it’s that simple! Use competitor research, LinkedIn search and tools such as followerwonk to identify thought leaders and influencers in your sector. Any information you can gather on your target markets is potentially invaluable. You can go direct to the source by using a free email survey platform like Survey Monkey. These provide easy to use templates to set up and distribute detailed customer surveys. Google Forms are another good option for creating simply surveys. You can also embed one easily into your website…. See the email marketing section for more information on building email lists. Try to offer recipients something in return for filling out the survey – incentivise it! This might be as simple as sending them a report on the survey results particularly if the information would also be useful to them. Spend some time finding out where information is shared and distributed online within your industry or sector. This may include forums, blogs, online magazines and other social media channels. Determine if there are places where they overlap. Consider how you might effectively engage with and contribute to the conversations on these platforms and websites. To monitor your competitors’ search engine results performance you can either use tools like Advanced Web Ranking or do some straightforward searches in Google for your own industry, sector, product & service keywords. See who and what websites are ranking well for those keywords. Look at their websites, their content and online marketing approaches. See what they are doing well and what you can potentially do to replicate or indeed leap frog their search results success. You may also identify linking opportunities or other websites you can ‘piggy back’ off i.e. quality link building opportunities, forums to participate on, and industry bodies to join. The list might also provide you with remarketing opportunities. Use software like BuiltWith to find out what you can about the different website platforms and content management systems available. Looking at competitor sites and websites with similar products or services can help you determine which might work best for your business. Determine the optimal layout for your website navigation based on the site’s content and the type of product or service offering. An ecommerce site will typically have a distinctly different layout and navigation system to an IT services provider. Again, looking at competitor or similar sites can help to determine the best approach for your website. With your Strategic Business Goals in mind consider what calls to action are most appropriate for your website. Your calls to action may encompass phone us, email us, product downloads, video to watch, gallery views, content sharing opportunities etc. Your website should induce action from the visitor. This action should ultimately be some form of contact or engagement using one of the potential calls to action. Your Digital Marketing Strategy document is a high level document that takes in broad areas of your business. This should quickly and clearly outline the main actions of the plan and give an overview of the digital marketing strategy. Outline your main competitors – document their website performance, keyword focus, social media engagement and paid advertising approach. List the goals of the digital marketing strategy. They should be clear, measurable and achievable. Outline which specific strategies, approaches and techniques will be used in your Digital Marketing approach. This should outline an honest evaluation of the current status of the company’s online presence. How is the website performing in search results? What are the traffic levels and the sources of our website traffic? Does our website load quickly? How well is our website optimised for search engines? Is it designed responsively for mobile devices? Is our online marketing driven by an underlying content marketing plan? What is the current approach to social media platforms? What calls to action do we currently employ – are they appropriate? What is the current hosting set up and is it appropriate for our business? Documenting the specific content approach to be taken, what it will include, resources to carry it out and an implementation plan. Establish responsibilities and ownership for each aspect of the project and timescales within which each element is to be completed. 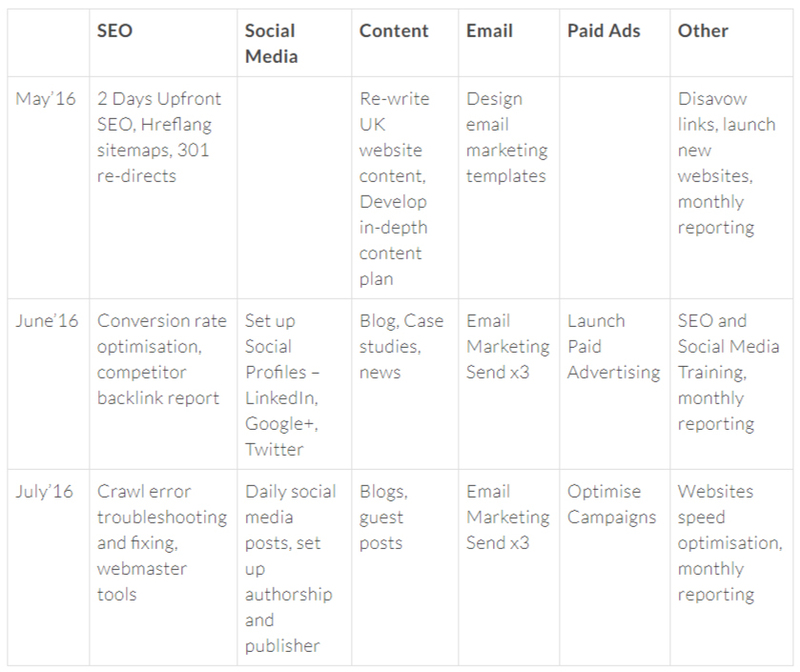 Which digital marketing channels will you focus on? E.g. Adwords, SEO, email marketing or social media. Having looked at your current website and the factors underlining its current performance it’s important to look at what your competitors are doing. We have prepared a detailed competitor research post on this key area on our own blog. By understanding what competitors are doing with their online marketing initiatives it will give you insights on areas for you to focus your attention to differentiate your business online. Web design and development – what platform are they using, what calls to action do they have on their site and why? What USPs and key messaging are they promoting? Keyword research focus – Knowing what keywords your competitors use in their Meta Titles, Descriptions and page content can help you identify their Keyword focus. Content development and Content Marketing – content marketing is the key driver behind all online marketing activity so it’s important to understand this key area. Social media approach – Social media can be a valuable source of website traffic as long as you are using appropriate platforms for your business. Researching your competitors’ social media profiles can not only help identity relevant platforms but also the different approaches to engagement on these platforms. SEO – in the blog post, Top 10 Digital Marketing Tools for SMEs we give you the tools required for you to identify what is the search engine focus on each competitor. Only by understanding their focus can you define and go after your own niche or decide to compete head on. Paid Advertising – Are your competitors using paid advertising such as Adwords or social media ads to reach their target audience? Laying out your Digital Marketing Strategy is relatively easy. The hard part is putting it into action. Planning is vital here. You need to ensure each step of the Strategy is accounted for, has a person made responsible, a time frame for completion and measurable metrics for each activity. Some of the work will be done in-house and some may be done by your Digital Marketing Strategy bpartner. Document a month by month plan outlining who is responsible for each task. At the end of each month a call or meeting between all parties can be held to confirm what has been carried out, coordinate activities, highlight problems and plan the subsequent month. This approach creates structure while leaving enough flexibility to accommodate the inevitable yet unforeseeable complications that arise. For example typically Inspiration will help our clients set up Social media profiles and syndicate those content elements which we are responsible for developing. However the day to day management of social media engagement is best done in house. Paid advertising is a specialist area and should ideally be outsourced to a specialist. Technical SEO is normally not a skill set that exists in-house. Content Marketing should be a shared activity between client and partner as its central to and drives all other digital marketing initiatives. A roll out plan can take many forms. We believe in keeping this simple. High level Summary Activity table and detailed month by month plan in tables below. The format is not important. It is important that the roll out plan identifies all the tasks to be completed, timing for implementation, person who will complete each one and the key metrics for measuring effectiveness of each component.